Shark Point dive site or Hin Musang to the west of Phi Phi Island is named for an overwhelming presence of Leopard Sharks. It is not to be confused with the (local) Phi Phi Shark Point (Hin Bida) which is just off the east tip of Phi Phi Lay’s southern most tip. Located to the west of Phi Phi Don about half way between Phi Phi Island and Phuket, Shark Point (Hin Musang) is best described as three pinnacles which line up north to south, starting with the largest and most northern pinnacle which protrudes from the waters. The second and third pinnacles reduce in size in a southerly direction. It’s a 20m swim from point 1 to point 2 over a sandy bottom strewn with garden eels and the occasional gorgonian sea fan but there’s always enough shelter to make the swim comfortably even in strong currents. 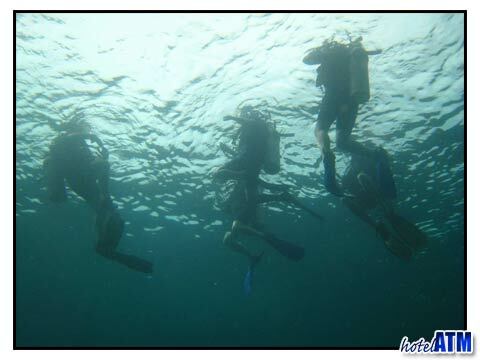 Just follow your guide and stay low to the sea bed (18m) to get maximum protection. There’s so much to see on the first two pinnacles that most dives are concentrated around these two points. Covered with soft corals, anemones, barrel sponges and sea fans Shark Point is always teaming with marine life, from the common, to the elusive. Each peak has so many little coves and overhangs it’s a perfect place for the likes of seahorses, Ghost Pipefish, Frogfish and several species of Nudibranch to take shelter. Divers can enjoy shoals of colourful Reef-Fish, including Blue-lined Snapper and Harlequin Sweet Lips, not to mention more static attractions like multi-coloured Plume Worms, Feather Stars and Crinoids. 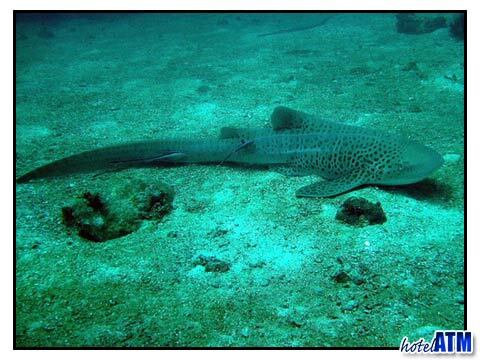 As one would guess this popular Dive Site‘s name refers to the overwhelming presence of Leopard Sharks, although not always guaranteed during peak season due to the large number of trips to this site. It’s a different story during the quieter Green Season when it’s very common to see 4 -5 together. Thanks to a breeding initiative by the PMBRI (Phuket Marine Biological Research Institute) Bamboo sharks are also starting to make a comeback to this popular dive site. Conditions can vary to extremes with visibility and currents but it’s always a rewarding and interesting dive. It’s suitable for Open Water divers and above and a definite favorite site for Photographers and videographers alike as there’s always so much to shoot. It’s also an ideal dive to use Nitrox. If you’re not already certified for this you should speak to your dive centre for more information.